From personal experience, and what I’ve seen happen over and over again in my support groups, it’s better for you to not go out during a flare. It would only make you worse, it’s a lot of exertion and sensory stimulation. Plus there is the added stress that inevitably comes from them not really knowing what to do with us or how to help. I’m not a doctor, and you will know your body better than anybody else, but if I’m just flaring, and if I think about it I could probably tell whether I’ve overdone things and am paying for that or not, then I do not need to go to the emergency room. They will just carry out unnecessary tests, stress my body and my mind and the bright lights and noise will just cause my symptoms to increase, not to mention the travelling there and back that will affect me for days or even weeks to come. If I feel like I’m about to collapse from exhaustion, I’ve already overdone it and need to be in bed, not driving around town and trying to explain this very misunderstood illness to hospital staff who won’t be equipped to do anything for me. Most people in emergency services won’t have even heard of ME/CFS and it won’t show up in any of their tests unfortunately. The exhaustion and weakness I feel in a flare is something unlike anything a healthy person would feel. I could never have imagined somebody could feel so weak and powerless to even lift an arm, turn in bed or even speak one word, but I’ve experienced it, I know how bad it can get. I did go to the emergency room early on in my journey with ME/CFS, I think when you initially fall ill with this, you cannot quite fathom how bad it could get sometimes, so when the first big flares hit you, you think you might actually be dying and need medical attention. I was at a sleepover with a friend after having some tests done at the hospital and being too weak to travel back home when my first major episode of post exertional malaise (PEM) hit me. What I now know was simply payback for the trip to the hospital and the stress of having tubes stuck in my arms for hours, I thought then was possibly some sort of organ failure or attack, as did my doctor who happened to call me right in the middle of the episode. I was struggling to breathe and talk and my heart was racing. She told me to go to A&E and made it sound like it was very serious. The emergency room staff didn’t take things as seriously and I ended up waiting for ages, slipping off my chair because my legs couldn’t hold me up, then being dragged backwards through the wards on a wheelchair, and having something (not blood) sucked out of my arm when the guy missed my vein, having to wait in a busy ward for another nurse to get my blood, getting undressed for heart monitor with the curtains not properly closed and the inconsiderate nurse not happy with my modesty causing her delays… just so much stress for absolutely no help at all! Once again all tests were negative and once again nobody knew what to do for me because they couldn’t find anything wrong with me… I’ve now spent over 2 years mostly in my bed and have needed my family to help me with all sorts of things; from carrying me up and down the stairs, washing, brushing and drying my hair, dressing me and even holding me upright while I sat on the toilet. It can get very bad, but it passes if you give your body the rest it needs and you can see great improvements. Going to the emergency room is a very last resort for me now, in fact I’ve only been once since then and it was for an unrelated allergic reaction, that too was a waste of time and energy for me. I now know how much my body can handle without dying, so I won’t go there unless I really think I’m on my way and need them to keep me alive. Going there for any other reason is, in my opinion, simply asking for bigger flares and more stress. And I even think it’s a waste of their time and resources because they can’t fix us anyway – I know that, even if they don’t. So in my opinion it is our responsibility to make sure that the people around us know what to expect, what to do and at what point they will need to call for help. For me that point is sudden unconsciousness or heart palpitations that won’t calm down or pain that is unfamiliar and too intense to handle. Or of course if the person with me feels completely unable to handle the situation, they might call for help and explain the situation to the emergency services who can help decide if their services will be required. Flares feel crap, worse than that, but you will get through it. I felt early on that I needed to create an action plan for those moments when I’d possibly be unable to function. Those moments do come and they are very alarming for you and anybody with you. I made sure to tell the people around me what was going on. I had packed an emergency overnight bag and had a little notebook with symptoms and medications listed in it as well as emergency numbers, next of kin, etc. There was a list of instructions for whoever was with me or found me. I wasn’t taking any chances when I was living alone at the beginning of my illness. I told a neighbour, I told my friends who came by most frequently and I had my family checking in on WhatsApp daily while I was living alone. Once my sister moved in with me to be my carer, this all became less complicated as she was always with me to make sure I was okay. I never had to use that bag. I’ve since let it go, I’m no longer fearful of those “feel like I’m dying” moments, because I’ve had so many and I know they pass. The last thing I need in those moments it so move, even from my spot in the house, certainly not going out to the hospital. Stay home – Don’t have more than one person around you at a time, more than that will probably make things worse because of sensory stimulation. Don’t go out while you’re already feeling weak or shaky. Those symptoms are not normal for healthy people and are a sign your body is struggling, it needs rest. Rest – preferably in bed, you need to get out of the flare before you attempt to do anything more, the only way to do that is to put everything else on hold and ride it out. Nourish – clean, additive free, natural, home cooked food is optimal, but not always possible in our condition, just make sure you’re eating good protein and nutritionally dense foods, this can include canned and frozen foods if you’re too weak to chop and cook the food. Hydrate – lots of water and include electrolytes and mineral rich salt (celtic or pink himalayan). Scale back on activities and delegate to give your body proper rest. This means skipping showers, order your groceries online for delivery, realising the chores aren’t vital to your survival and can be left undone. Ask for help – Having somebody who can come take care of things while you’re flaring is beneficial. The less you are working, the faster you can come out of a flare. Get others to cook and clean for you, even if its only once a week and refilling your freezer with ready to heat up meals or ready chopped vegetables. I’ve now found my baseline where I know how much activity I can tolerate to feel quite normal, it’s a very low baseline, I can’t so much at all, but I celebrate what I can manage and I don’t feel awful all the time anymore because I stay within those limits most of the time. I feel it when I do more or go out or eat the wrong things. Sometimes for days, sometimes for weeks or even months. But it does pass and we must learn from our mistakes and our victories and continuously listen to our body. You can make improvements, but it will be a long, slow process of figuring out what works and what doesn’t work for you personally. Riding out the inevitable flares and restraining yourself on the days you feel better is a vital part of learning to manage ME/CFS. 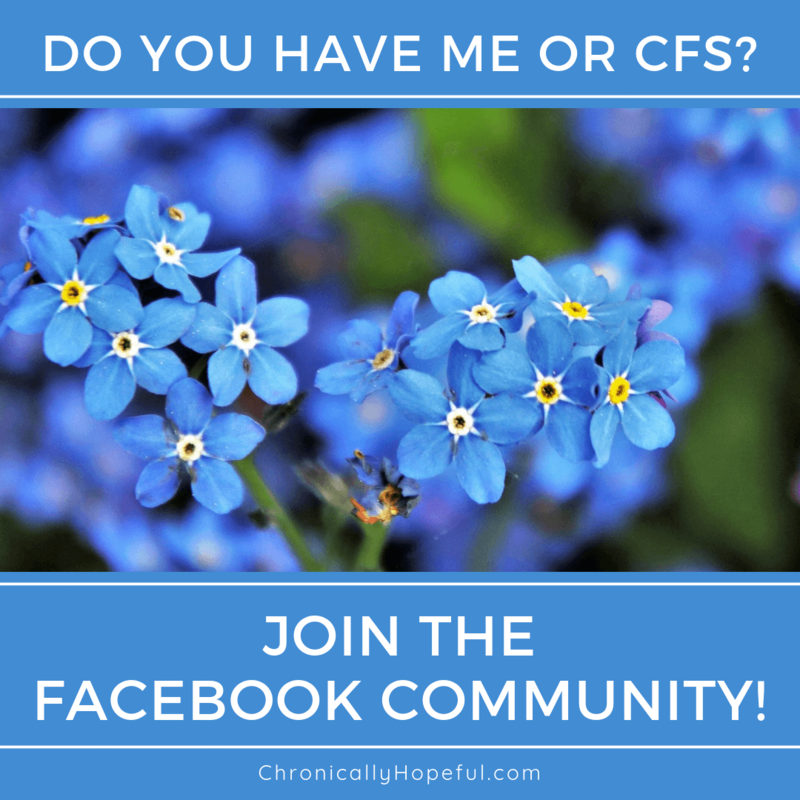 Have you been to the emergency room during your ME/CFS flares? Did you find it helpful or harmful? Please let us know in the comments below, or contact me privately. Wow, this is so helpful! It’s hard to think when you’re in the middle of a flare up so planning ahead is very necessary. And it’s good to be reminded that rest is what our bodies need the most, even if we think we need to do others things instead. Thank you for sharing your thoughts and tips on this blog, it’s helping me through this illness. Thank you, Melanie! I am so glad you are finding my posts helpful, it’s always good to get feedback. I’m following yours now too, love all your outdoor adventures! I look forward to reading more. Such great advice! And sadly, so true. I had abnormal labs and the ER still told me I was fine and sent me away. I would have never known if I hadn’t asked for the labs. I came a millisecond from passing out a few days ago, which they keep telling me I need to go to the ER for but it’s just too much stress to go. Great post, thank you for sharing your experiences.? It’s so strange to me how they will tell us there is nothing wrong when clearly something is wrong. They’ve lowered their standards to the point where they no longer look for optimal labs, but “it’s good enough – you aren’t dying” labs. Glad you caught it. We really have to be our own advocates!